Opened up 2 mines on Maple leaves: one live larva and one dead. Thank you T. Harrison for pointing out that these larvae are NOT Phyllonorycter lucidicostella but rather Cameraria spp., either C. saccharella or C. aceriella. He goes on to say: "Here's how to tell Cameraria larvae from Phyllonorycter larvae: The larva of Cameraria is noticeably dorsoventrally flattened (as in these) and makes a flat blotch mine that usually manifests itself on the upperside of the leaf. 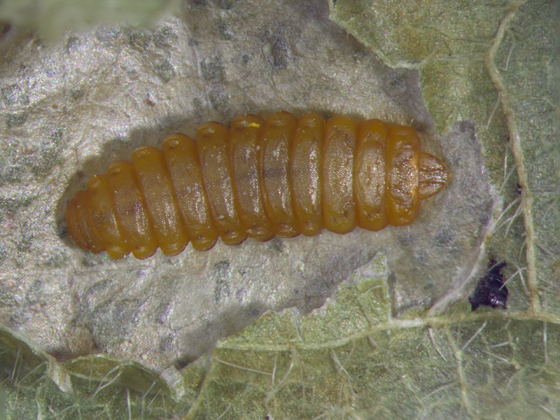 The larva of Phyllonorycter, on the other hand, is "cylindrical" (i.e., it looks pretty much like a tiny regular caterpillar; not particularly flattened) and the leaf mine is "tentiform" (i.e., drawn up so that it is roomy inside, like a little tent, rather than flat); and the mine usually manifests itself on the underside of the leaf." "As you probably have guessed already (since it quite evidently happened in this case), it is very common for more than one of the maple-feeding lithocolletine spp. of both genera to occur on the same tree, and sometimes even on the same leaf, at the same time." Moved from Lesser Maple Leaf Blotch Miner.